Alright people, I’m really sorry it’s taking so long to unveil these toys. I’ll try to post two this week to catch up a bit. Well, what do we have today? Ah. 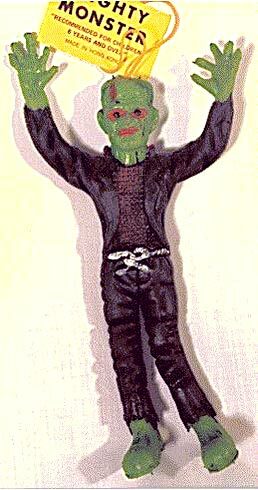 If it isn’t a good ol’ Frankenstein’s Monster toy. 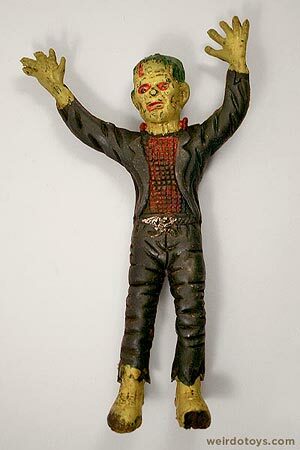 I don’t think this Frankenstein toy is THAT valuable, especially considering the shape he is in, but luckily for me, it’s his f-ed up look that makes him so irresistible. 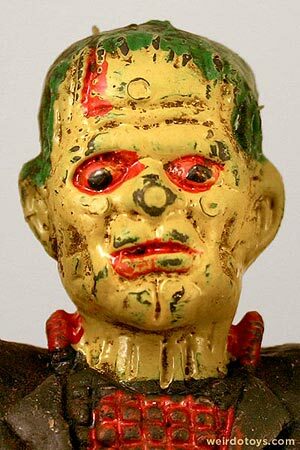 I don’t know what the hell has happened to Frankenstein (I know he’s formally “Frankenstein’s Monster,” but let’s face it. 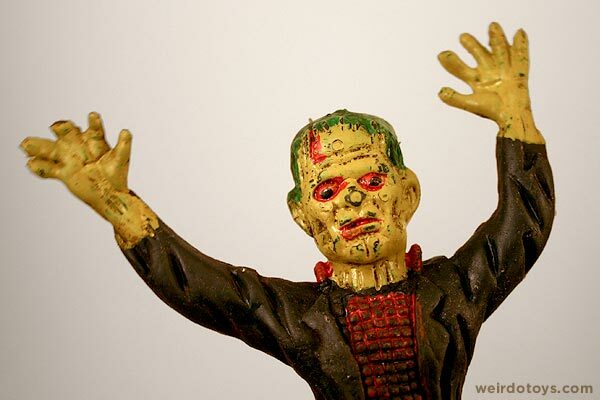 Everyone calls him “Frankenstein.”) I guess since Halloween is over, the Frankenstein hype is over. He’s looking a bit down on his luck. Is he homeless now? I know, reanimated corpses compiled of various cadavers’ parts aren’t pretty, but he’s looking pretty rough even to that standard. Poor guy. He can’t even afford a belt. He’s resorted to using a rope. Can you believe it ? And is it just me, or does it look like he’s wearing some kind of 80s Michael Jackson shirt? He must’ve gone to Goodwill. This toy is the epitome of ugly and neglected. First of all, he’s slimy to the touch. 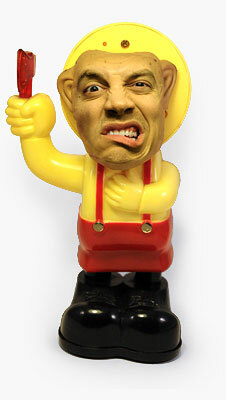 He’s made of a jiggly rubber… and along with the rubbery texture comes the stinky, old rubbery smell. This toy seriously has a funk. I’m not sure if it’s from the previous owners or from the chemicals that make up the toy. But outside of that, you can plainly see the toy’s been through hell and back. His paint job is all messy and scraped off. 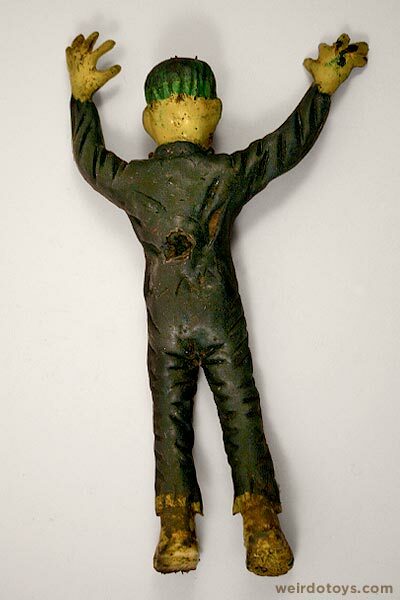 He’s missing fingers, chunks off his feet, holes in his torso, etc. He’s just another victim. I don’t know much about these jiggling monster toys, but over the years I have picked up on the fact that these things are iconic and sought after (Probably not the beaten-to-hell versions like this one.) 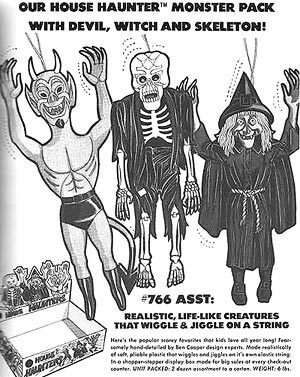 After asking Google about jiggling Frankensteins, I found some info about the toy and its maker. Apparently this is one of a series of toys called Wigglers by Ben Cooper. Ben Cooper made a bunch of these jiggly characters ranging from Dracula to Superman. Wiggler Ad image courtesy of PlaidStallions.com. Thanks! These little rubber guys dangled from strings so you could hang them and bounce them to your heart’s content. 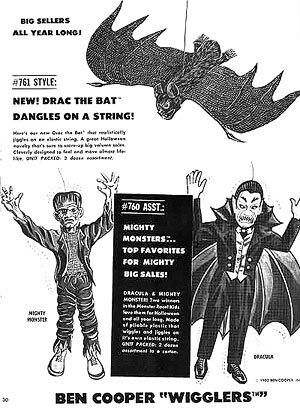 In this ad, you can see this Frankenstein toy was referred to as “Mighty Monster.” I guess they didn’t have the rights to the Frankenstein character’s name. 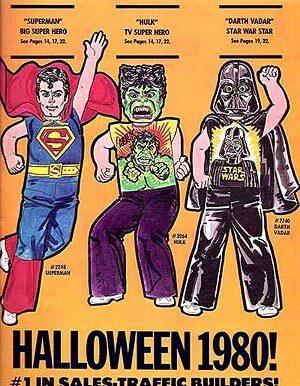 I think the gross, jiggling, rubber toys finally wore out their welcome, so Ben Cooper turned their sole focus to children’s Halloween costumes. They’d been making them since the 50s I think. The costumes were typically based on popular characters of the time. In fact, you probably even had some of these as a kid. I know I had this Hulk one. Masks Ad image courtesy of PlaidStallions.com. Thanks! Mighty Monster Wiggler image courtesy of The Gallery of Monster Toys. Thanks! Here’s a glimpse of how the toy might’ve looked brand new. This pic isn’t great, but it lets you get a sense of the original coloration and let’s you see the tag and all. Hm. Now that I think about it. Mine might be a repaint or a bootleg or something. Mine’s more of a mustardy, bird-crap-yellow. I like it better that way. I think my friend Brian said it best when describing this toy – “Seems like you can’t intentionally make him look like that.” Yep. That sums him up nicely. Oh, and one last thing. As you know, I sometimes feature videos on the site to more clearly illustrate a toy’s features. Well, here’s a look at a Mighty Monster Wiggler in all his jiggly glory. Also, his arm-waving stance inspired me to make it a music video. It’s quick and stupid, and it might be accidentally entertaining. 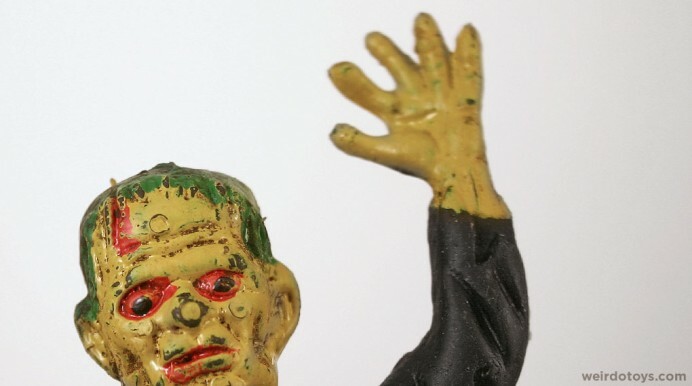 Buy Frankenstein toys on eBay! Thanks krakit. That was the first and last take. No choreography in the Weirdo Toys budget. Thanks for the kind words Bubba and Old Fan. Also, I just found out my video has been flagged for copyright issues. I’ll see if I can get it resolved. It’s much better with the music. That video is just awful! Awful in a good way. Thanks so much for these goofy posts! Continually making us jealous while entertaining us. Thanks. it’s amazing how well that toy has held up, i’d think that after a time those would just deteriorate like a stretch armstrong or like a head of lettuce left behind a radiator. 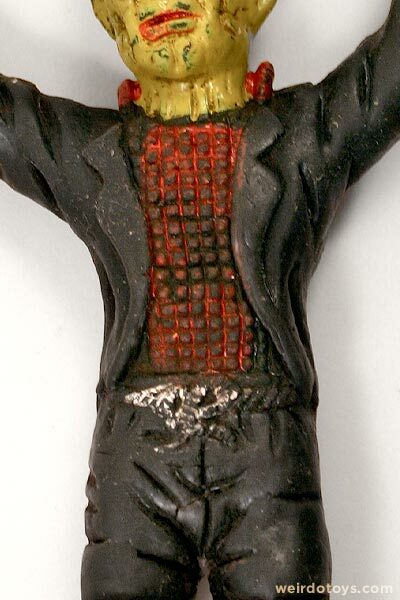 I did just notice there’s crotch rot on this toy. I totally should’ve photographed it and posted it here. Now that is worth the time and effort to produce something I gotta have! If ya have a link where I can purchase the Frankenwiggle I’ll become a member fer life! Ha! Thanks. Maybe I should go pro. This site is amazing. I just stumbled on it after googling ‘ugly Frankenstein’. What awesome luck! I love it!